Beginning October 23, 2017, Socrates Sculpture Park invites artists to submit proposals for the Emerging Artist Fellowship (EAF), an annual residency program and The Socrates Annual exhibition that awards 15 artists the opportunity to produce and exhibit sculpture and installation in the Park. 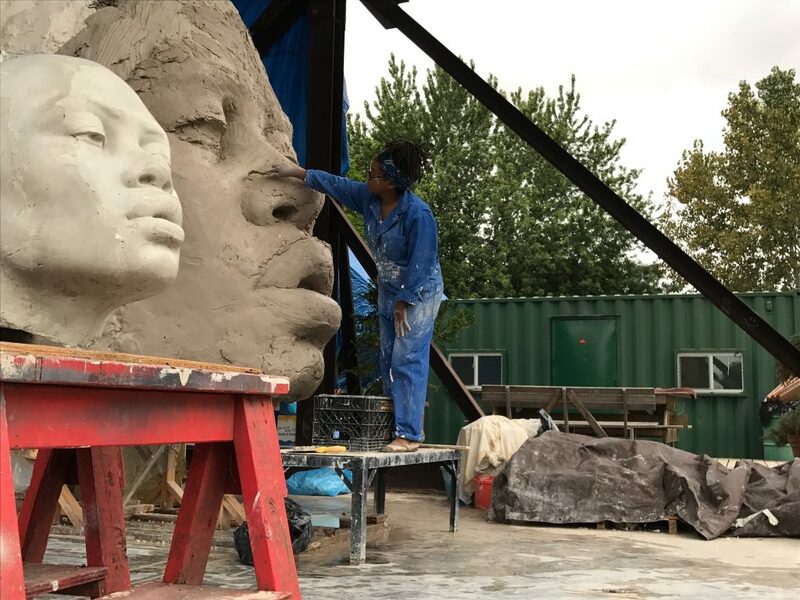 EAF18 recipients will receive a $5,000 production grant to support their project, and five-months of seven-days-a-week access to the resources and fabrication facilities of the Park’s outdoor studio. The completed works will become part of an outdoor exhibition, The Socrates Annual, opening in fall 2018. In addition to the production grant and studio access, Socrates will produce an electronic publication to accompany the exhibition and be made available online, for free. A printed version of the publication will be provided to EAF18 artists. Administrative support may also be provided for additional fundraising and securing in-kind contributions depending on the project, but artists should propose projects within the parameters of the production grant. Artists are responsible for the fabrication, transportation (if necessary) and installation of their works. Socrates will provide some limited technical and installation assistance during a three-week installation period, M-F, 10AM – 6PM. Specifics of assistance will be discussed with each artist selected. Applicants are strongly encouraged to visit Socrates, a unique waterfront park located in an industrial area of Long Island City, Queens, before preparing their applications and to explore Socrates’ website to learn about the history and context of the organization and exhibition archive. Visiting the Park will give applicants a better sense of the factors that effect installations in the Park and an overview of the facilities available at Socrates, from the tools and equipment in the studio to the resources of the surrounding neighborhood in Long Island City. The EAF program is based on a competitive, open application process. Completed on-line applications must be submitted by the deadline (December 18, 2018 at 11:59PM) and will be reviewed by the Socrates exhibition department and two curatorial advisors. Fifteen artists will be selected for the 2018 program. Artists are selected based on the compelling nature of the project proposed, clarity of intent and unique approach to the site and public context. Following the recommendations of the curatorial advisors, Socrates staff will contact applicants individually to discuss proposed projects before confirming the final selection in spring 2018. Once accepted, Socrates staff members will meet with each Fellow to discuss project proposals in detail and begin to assist with the development, engineering, and installation of the work. A group meeting for all 15 Fellows and Socrates staff will take place one evening in late April or early May, followed by an on-site orientation and individual progress meetings throughout the fellowship to assess progress, troubleshoot issues, and review next steps. Selected works are subject to final approval by Socrates staff and must meet safety requirements to be able to withstand the effects of weather and public use. Fellowships are awarded to artists whose careers and artistic practices would benefit from the opportunity. Artists who are enrolled in a school, college, or university at the time of application are NOT eligible for the Emerging Artist Fellowship program. Artists who have applied before (but never shown at Socrates) are eligible. Only online proposals are accepted. Email EAF@socratessculpturepark.org with questions or concerns. We are eternally grateful for longstanding support from the Jerome Foundation, National Endowment for the Arts, and The New York Community Trust, which has enabled the Emerging Artist Fellowship program to grow and evolve since its founding in 1995. Socrates Sculpture Park’s major exhibition support is provided by grants and contributions from the Milton and Sally Avery Foundation, Bloomberg Philanthropies, Charina Endowment Fund, Paula Cooper, Mark di Suvero, Sidney E. Frank Foundation, Maxine and Stuart Frankel Foundation for Art, Agnes Gund, The Kayden Family, Lambent Foundation Fund of Tides Foundation, Ivana Mestrovic, Nancy Nasher and David Haemisegger, Joel Shapiro and Ellen Phelan, Plant Specialists, Leonard and Louise Riggio, Silvercup Studios, Mr. and Mrs. Thomas W. Smith, Spacetime C. C., and our generous Board of Directors.. Additional support is provided by the New York State Council on the Arts, a state agency, and the New York City Department of Cultural Affairs, in partnership with the City Council. And special thanks goes to our public partners, including the City of New York, Mayor Bill de Blasio, Queens Borough President Melinda R. Katz, City Council Speaker Melissa Mark-Viverito, City Council Members Jimmy Van Bramer and Costa Constantinides, the NYC Department of Parks and Recreation, Commissioner Mitchell Silver, and the NYC Department of Cultural Affairs, Commissioner Tom Finkelpearl.